Instore uses a plastic-based gift card system designed to be swiped just like a credit card at your point of sale. These cards can double as Rewards cards. Plastic gift cards should be ordered beforehand. Please request help from our support team if needed. The iDynamo credit card reader or Elo PayPoint built in reader can be used to read Instore gift cards. Your iPad must be connected to the internet to sell and swipe gift cards, otherwise, Instore cannot retrieve customer information or check the gift card balance. From the Instore app bill screen, swipe a gift card through the card reader to initiate the Gift Card edit screen. To manually input a gift card number, you’ll need to create an Item in your Menu called Gift Card. Enter the load amount in the “Funds to add” field. You can optionally add customer name, email, and phone number to associate with the card. Accept payment for the load amount via the Pay button. Instore will add this gift card to the bill. The customer can then pay for the gift card using cash or credit as a payment method. If the bill is not paid, the gift card will not be activated for use. Reloading a gift card in person can be done following the steps listed above. Remote card reloading is possible by either a) looking up the customer record to find the attached gift card or b) selecting the Gift Card item on your menu and manually entering the card number to load. In either scenario, you can manually enter a credit card number (or select another payment method) to complete the reload. To pay for an order with a gift card, tap the Pay button on the bill after adding an item to the bill. Swipe the gift card just like you would a credit card. If the card swiper is not working, you can manually enter the card number in the Card area of the Pay screen. 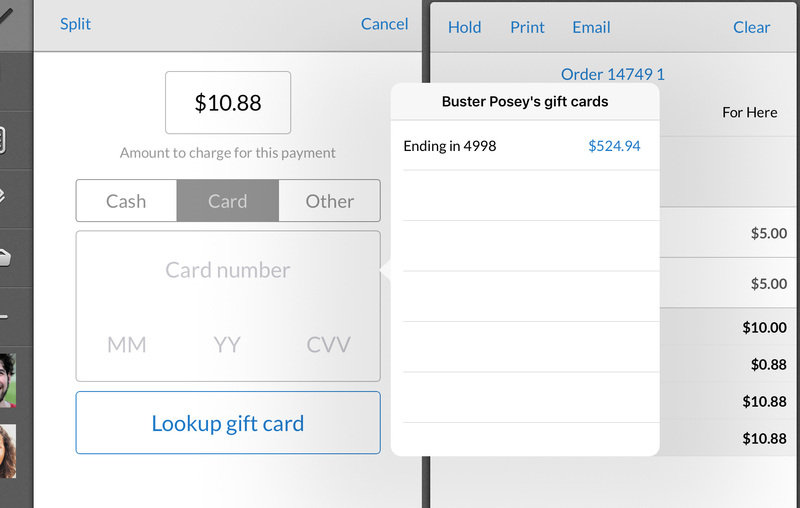 After completing the order, hit Pay, then Card, the Lookup gift card.